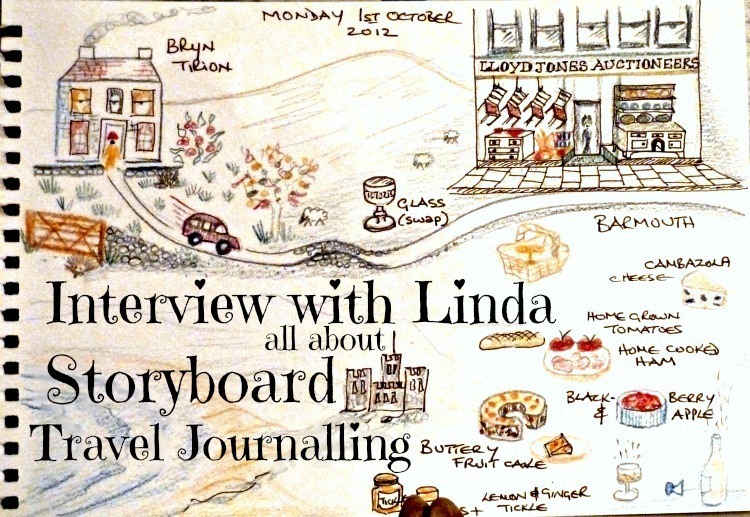 On a recent trip to Europe Linda tried a storyboard journal approach to her travel journaling – which she sometimes calls story mapping! 1. Why bother to storyboard journal? My memory (sadly) is not infallible. I therefore need a travel journal as a memory jogger. 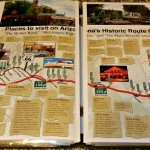 Flicking through travel related memorabilia re-ignites those fun holiday moments. 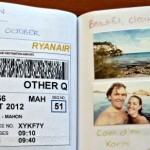 There would be many forgotten scenarios lost – never to be enjoyed again – without the help of my travel journals. 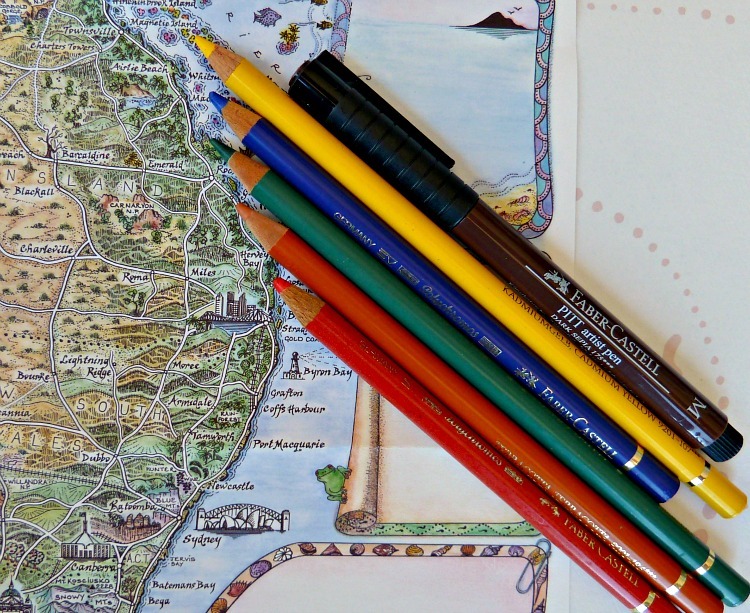 journaling brings those travel memories back to life. In the story-map above I got hopelessly lost driving from Wales to England. 2. 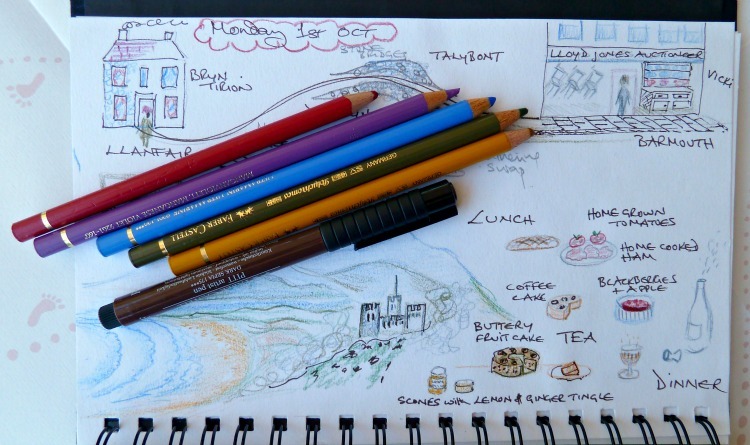 What do you include in your storyboard journal? When I first started travelling I merely wrote pages (and pages) of words as I thought that’s what you’re supposed to do in a travel journal. It’s amazing how evocative a few scribbly lines can be. However, on my most recent trip to Europe, this evolved a little bit further when I tried the concept of keeping a story-map journal. One on a cogwheel train ride up to Schynige Platte where the vintage train wound its way up the mountain and into the clouds where by the time we reached the top it was raining with no view in sight! And a vernacular ride up a virtually perpendicular track to Harder Kulm where there was a glass bottomed triangular lookout to the two lakes below. 3. How do you keep your storyboard journal? I’m more of a visual person than aural – My eyes glaze over at the sight of pages and pages of words (with no pictures!). I love keeping receipts, ticket stubs and things like paper place mats all in a separate zip-lock bag. For my European Storyboard journal I used a page a day to map out the day’s events. I’ve since gone on to experiment with both watercolour journals and the accordion type, which I have to say is now my favourite! 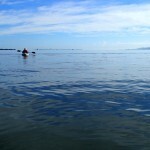 I incorporate where and how we went, what we saw, what we ate (yum! ), the weather, the landscape… all the usual things that go to make a great trip – but its encapsulated on a single sheet rather than pages of my poor prose. Importantly, I don’t rely on my fair eye to create all the drawings – The mountains above appeared on a place mat I was given in a restaurant – Far easier to copy off someone else’s rendition than try and draw if fresh, or even trickier, recall such a stunning landscape from memory! Note: Tourist brochures often offer diagrammatic plans and layouts of places that you can copy to get the ‘shape’ of where you’ve been! My European trip was full on, with every day fun packed to the max. It was all record worthy – I didn’t want to ever forget any of it! 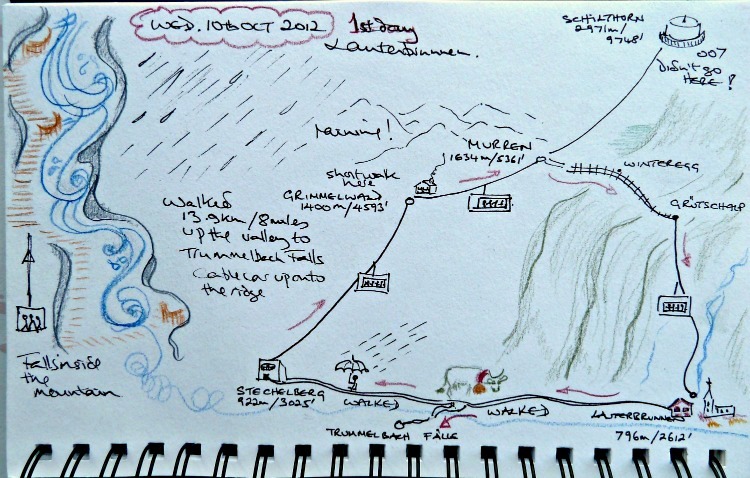 Some evenings I’d doodle-draw entries whilst chatting around the table recounting the day’s events – journaling can be quite a social activity! 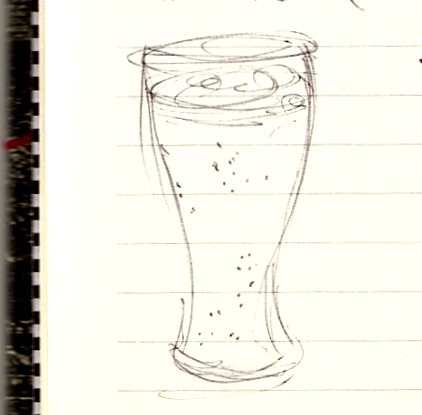 On other evenings, if we went out to eat, I’d spend half an hour at day’s end sketching in bed before lights out. At the start of the trip, the daily activities took up every waking hour and I fell a bit behind – I wondered whether I’d ever be able to catch up. But in the end it’s all down to how much you really want the outcome, and how much fun it is in the creating! Colours and tones will vary as to which part of the world I am in and will always be tonal rather than mere primary colours. When in Great Britain I’ll have a heathery purple colour, an olivey green, a mustard yellow (for the gorse), a cornflower blue and a dark red. Whereas in Australia I’ll have a silvery green (for the eucalypts), ultramarine blue, bright yellow, hibiscus red and a rusty brown for the arid landscape. And I know I’m only supposed to have ‘a’ favourite – but I do also love my Faber Castell Pitt pens in dark sepia, which are waterproof and come in a few different thicknesses. Deciding to keep a ‘Storyboard’ journal on this trip gave me permission to doodle draw the day’s events. 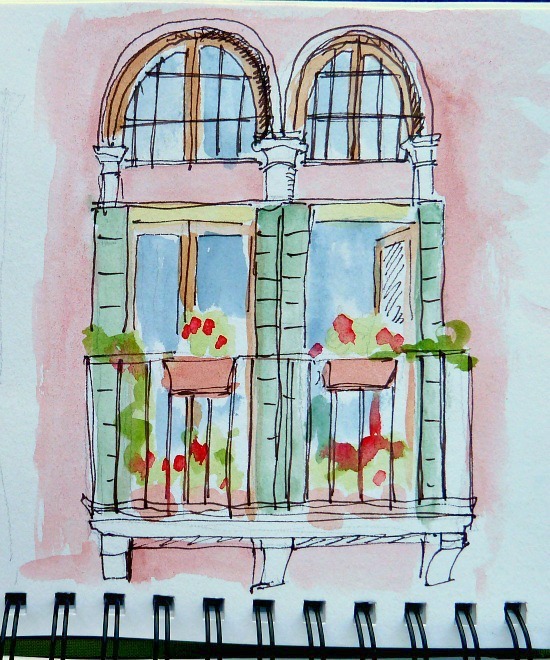 So, scooping up some canal water into a pot I sat on the edge of the waterway and sketched these ‘french’ windows that were over on the other side. I penciled lightly the approximate shape first, blobbed in the areas of watercolour and then with my Faber Castell Pitt pen sketched in a little more detail over the top. Its not frame worthy but that moment of breathing in Venice will be with me forever. Note: Even on a hectic schedule stop and smell, in this case… the canal water! 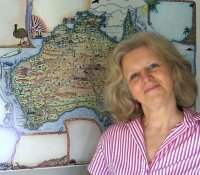 Linda Fairbairn started travelling the world at 18, when she left England for Scandinavia. The following year she island hopped through Indonesia to Australia, returning to Europe overland. She now lives in Australia… enjoying spontaneous sojourns around the world. 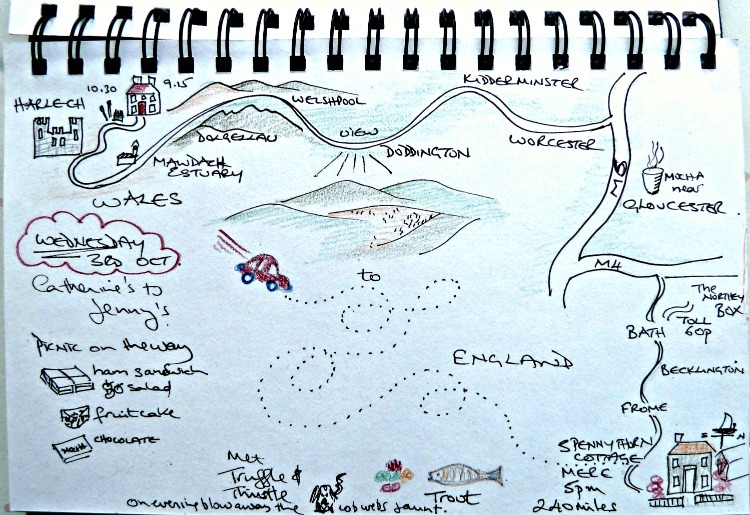 This entry was posted in Creating Story Maps, Interviews with Travel Journallers and tagged doodle, journalling_tips, travel_journal by Linda. Bookmark the permalink. I’m a huge photographer too Andi! I kept a blog and posted every few days when we did a 10 week roadtrip. My partner wrote a few notes in his iPad diary every day about what we did. You must get those blog posts turned into hard copies to give to the boys when they’re older! Did they get to use their travel journals? Just beautiful thoughts, pictures and words there Linda. I am a wordsmith, and cannot draw to save my life, but just have to write down what is happening, and then I can put the embellishments and humour in later on, sort of like painting a picture with my words. Either way it takes a lot of work to write something succinctly, which is why you may have noticed, I’ve relied on some else’s words to convey the point! I think the tragedy is that we’re all just soooo self-critical! These days you can use an application called Evernote found both on iPhone and Android mobile phones to keep your journals and take photos as attachments. This will certainly help you very much. Using this application or similar ones, you can always have your notes with you on your phone and take real shots in such short time and keep them in your memoir. What a fabulous idea! 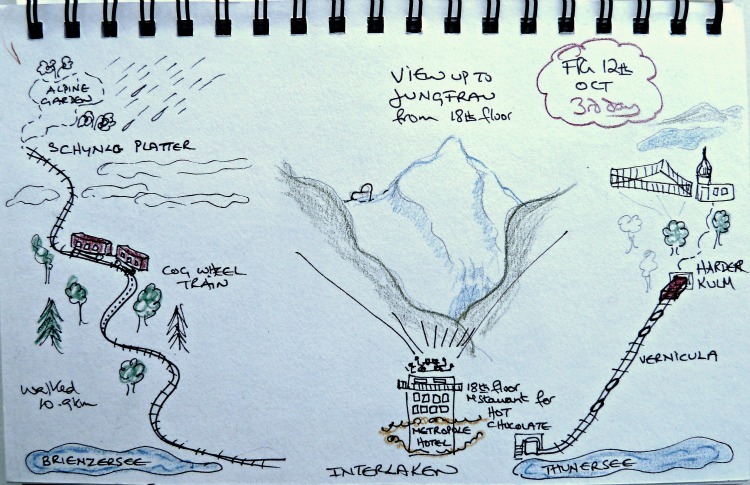 I’ve never given a thought to sketching my travels, but after seeing these great drawings I will give it a try. Like Genevieve, I am a writer so do tend to dribble on a bit – love those quotes from Pascal and Thoreau – that’s me to a tee! 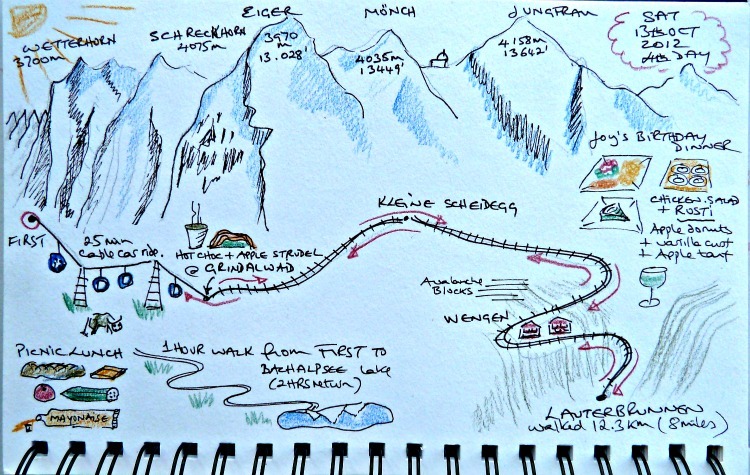 Interestingly, I am doing a coach trip around Europe in 8 weeks, and going to those exact places in Switzerland that you sketched – so you have inspired me so much! Super envious of your upcoming trip to Switzerland Judi! This is such a lovely idea! I keep little mementos and take lots of pictures, but then things sort of blur together…I will have to make an effort to try this. Even to just jot down the names of all the places, and the order. I just love this, thank you for sharing! So happy to hear this had given you a few pointers for another way to help keep that vacation smile on your face… for longer! !